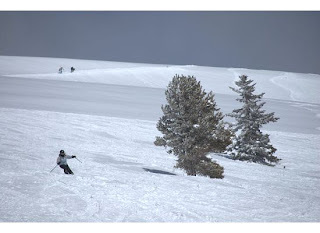 Skiing Vail's bowls in 2010. I know that I like a lot of sports--and that I like to participate in a lot of sports. But there's no doubting the fact that I am a skier. I married a skier. I haven't gone a single season since 1992, if not 1987 when I was out with a broken leg (thanks to sledding into a fence), without skiing. And right now I'm trying to make myself feel better about the fact that it dumped in ski country and I can't be there to partake in it. So I'm thinking skiing, and what can maybe make some of us skiers. Your Twitter feed is literally a string of posts about white-outs, snow conditions and powder days to be had. Your Facebook news contains picture upon picture of powdery action shots or snow-covered mountains. Your inbox is full of press releases about snowfalls, events happening at ski resorts, and more. You're excited to talk skiing even when it's nearly 90 degrees outside, it's summer and it's still months before you'll be on your skis again--and you live no where remotely close to true mountains . You're shopping for flights to Colorado, Reno and Salt Lake City in January, February and March instead of tropical paradises. You're addicted to checking your stats on EpicMix, and you have a cache of ski-related apps on your smartphone. You have a ski season pass even though you can't simply hop in the car and drive an hour or two to use it. You'll ski on days when the conditions are far from perfect--rain, hardly any snow, slush, you name it. You've been told you ski like a regular even though you can count the days you ski per year, unless you've been really lucky, on one hand. You beg lifties to let you on the lift up until closing time--and you rush down the mountain in hopes of getting one last run before heading in. You don't know what it's like to have a spa day at the Cliff Lodge, Alta's Rustler Lodge, or the Keystone Lodge unless someone has made arrangements for you (and you're on a media visit)--you're too busy skiing and tearing up those muscles that the massages repair. You can name all of the resorts you've skied at and you remember when you skied them--and you have a list of all the places you still have to and want to ski. You have a great Sunday morning run yet you can't help but wish you had been skiing over the weekend instead. You've never watched this many episodes of The Bachelor (ahem, all of them), but you tuned in because you continued to find ski adventures--in San Francisco, at The Canyons, in Switzerland. We all have different reasons for loving to ski. These are some--or many--of mine (I thought of a few more while swimming laps in the pool--see my mind drifts toward skiing--but I forget them). What makes you a skier? Photo courtesy of Vishal Verma.